Chicago-style pizza is pizza prepared according to several different styles developed in Chicago. The most famous is deep-dish pizza. The pan in which it is baked gives the pizza its characteristically high edge which provides ample space for large amounts of cheese and a chunky tomato sauce. Chicago-style pizza may be prepared in deep-dish style and as a stuffed pizza. According to Tim Samuelson, Chicago's official cultural historian, there is not enough documentation to determine with certainty who invented Chicago-style deep-dish pizza. It is often reported that Chicago-style deep-dish pizza was invented at Pizzeria Uno in Chicago, in 1943, by Uno's founder Ike Sewell. However, a 1956 article from the Chicago Daily News asserts that Uno's original pizza chef Rudy Malnati developed the recipe. The thick layer of toppings used in deep-dish pizza requires a longer baking time, which could burn cheese or other toppings if they were used as the top layer of the pizza. Because of this, the toppings are assembled "upside-down" from their usual order on a pizza. The crust is covered with cheese (generally sliced mozzarella), followed by various meat options such as pepperoni or sausage, the latter of which sometimes is in a solid patty-like layer. Other toppings such as onions, mushrooms and bell peppers are then also used. An uncooked sauce, typically made from crushed canned tomatoes, is added as the finishing layer; though sometimes, a sprinkling of Parmesan cheese is added for extra flavor. It is typical that when ordered for carry-out or delivery, the pizza is uncut, as this prevents moisture from the sauce and toppings from soaking into the crust, causing the pie to become soggy. Some Chicago deep-dish pizza restaurants ship their pizzas, partially baked and frozen, within the continental United States. By the mid-1970s, two Chicago chains, Nancy's Pizza, founded by Rocco Palese, and Giordano's Pizzeria, operated by brothers Efren and Joseph Boglio, began experimenting with deep-dish pizza and created the stuffed pizza. Palese based his creation on his mother's recipe for scarciedda, an Italian Easter pie from his hometown of Potenza. Chicago Magazine articles featuring Nancy's Pizza and Giordano's stuffed pizza popularized the dish. At this stage, the thin dough top has a rounded, domed appearance. Pizza makers often poke a small hole in the top of the "lid" to allow air and steam to escape while cooking, so that the pizza does not explode. Usually, but not always, tomato sauce is ladled over the top crust before the pizza is baked. There is also a style of thin-crust pizza found in Chicago and throughout the rest of the Midwest. The crust is thin and firm enough to have a noticeable crunch, unlike a New York-style pizza. 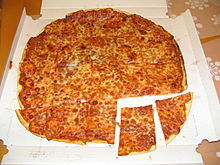 This pizza is cut into squares, also known as "tavern style" or "party cut", as opposed to being cut into wedges. Among locals, thin-crust actually outsells the more widely known deep-dish style. In most of the United States, the most popular pizza topping is pepperoni, but in Chicago the most popular topping is sausage. ^ Ali, Tanveer; Ludwig, Howard (January 13, 2015). 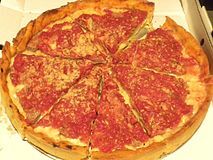 "A Guide to Chicago Pizza: From Deep-Dish to Tavern-Style and Beyond" Archived 2016-01-01 at the Wayback Machine, DNAinfo. Retrieved January 2, 2016. ^ Kindelsperger, Nick (June 2, 2014). "The Best Deep Dish Pizza in Chicago", Serious Eats. Retrieved January 2, 2016. ^ Borrelli, Christopher. "Tim Samuelson: Chicago's cultural historian". chicagotribune.com. Retrieved 2017-04-09. ^ "Who Invented Deep Dish? ", Chicago Tribune, February 18, 2009. Retrieved January 2, 2016. ^ "Pizano's Pizza and Pasta - About Us - The Best Chicago-Style Pizza and Italian Restaurant". www.pizanoschicago.com. Retrieved 2017-04-09. ^ Zimmerman, Karla; Cavalieri, Nate (2008). Chicago: city guide. Lonely Planet. p. 122. ISBN 1-74104-767-6. ^ Chu, Louisa (September 19, 2016). "Family's Stuffed-Pizza Dynasty Began with a Fight". Chicago Tribune. Retrieved September 21, 2016. ^ Pollack, Penny; Jeff Ruby (2005). Everybody Loves Pizza. Emmis Books. p. 33. ISBN 1-57860-218-1. ^ "Our Story". Nancy's Pizza. Retrieved 2017-04-09. ^ Vettel, Phil; Kevin Pang (2009-07-23). "Pizza slices: Two foodies debate the merits of wedge versus 'party cut'". Chicago Tribune. Chicago, IL: Tribune Company. Retrieved 2009-07-23. ^ Chahwala, Jaison (March 13, 2017). "20 Great Spots to Taste Real Chicago Pizza: Tavern-Style Thin Crust". Eater Chicago. Retrieved March 13, 2017. ^ Rousseau, Caryn (2014-09-19). "It's not all deep-dish pizza in Chicago". The Detroit News. Retrieved 2017-01-17. ^ John, Derek (December 20, 2013). "Deep Dish or Thin Crust? Even Chicagoans Can't Agree". NPR. Retrieved March 6, 2018. ^ Lutz, Ashley (October 10, 2013). "Here's a Pie Chart of the Most Popular Pizza Toppings". Business Insider. Retrieved August 23, 2017. ^ "The Top 10 Most Popular Pizza Toppings". Huffington Post. November 12, 2013. Retrieved August 23, 2017. ^ Kindelsperger, Nick (August 21, 2017). "Why Are Chicagoans So Obsessed with Italian Sausage on Pizza? An Investigation". Chicago Tribune. Retrieved August 23, 2017. Bruno, Pasquale, Jr. (1983). The Great Chicago-Style Pizza Cookbook. McGraw-Hill Companies Inc. ISBN 0809257300. Ruby, Jeff (July 2010). "The 25 Best Pizzas in Chicago". Chicago. This page was last edited on 20 April 2019, at 00:00 (UTC).